This RADIOLA! is an unflinching musical safari among the male humans that prowl the asphalt plain. (I'll try not to point, since I realize in so doing I'll still have three fingers aimed at myself.) Most of what you'll observe is benign, though it might not do to linger. On a much happier note, I've included a few selections from the new CD dedicated to the singing of British crooner Val Rosing. This CD was compiled and produced this year by Rosing's son-in-law, Bruce Kaplan, and features a delightful variety of selections by this undeservedly forgotten vocalist. And I found songs that actually fit into this show's theme. Tune in Friday at 8 PM Eastern to WHCL (with streaming here). The program will be uploaded to my Live365 station soon. 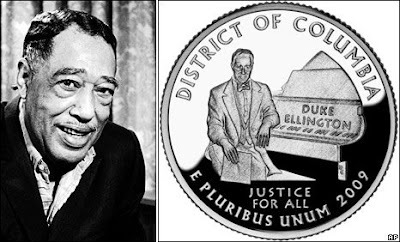 DUKE ELLINGTON ON U.S. COINAGE! The District of Columbia 25-cent piece features an image of Duke Ellington. Hooray!! VINCE GIORDANO STILL ON BROADWAY! Owing to Hamilton College sports broadcasts on WHCL, RADIOLA! will be pre-empted February 13 and February 20. The Live365 stream is available, as always. This is the second RADIOLA! dedicated to scarce recordings by legendary guitarist Eddie Lang, featuring more gems from Ray Mitchell's collection, some cuts from the Venuti & Lang Mosaic Box Set, a number of items suggested by Will Friedwald (of Toast of New York), and a few of my own 78s. The broadcast is tonight at 8 PM Eastern on WHCL (with streaming HERE). This show will be uploaded to my Live365 station soon thereafter.